Rhubarb is the harbinger of spring. It was the first up in my garden. Even ahead of the chives. I have dutifully plucked the smallest, most tender stalks for this recipe. The larger stalks will be made into a rhubarb simple syrup and a rhubarb bitters for summer drinks and cocktails. Line a loaf tin with kitchen plastic film. Put the chopped rhubarb in a medium-sized saucepan with the sugar, ginger and 2 tablespoons water. Heat gently until the sugar has dissolved, then add the rhubarb and simmer for a few minutes until the rhubarb is soft but still holds its shape. Take off the heat and cool. Remove ginger pieces after cooling. In a large bowl, whip the egg whites and 1/2 cup of sugar over a pot of simmering water with a hand beater until stiff, then set aside. In another bowl, whisk the yolks with the icing sugar until they’re pale and starting to thicken. Heat the cream to scalding and temper the egg yolks with it. Pour the mixture back into the pot and continue to cook over low heat until thickened. Cool. When completely cooled, mix the egg white meringue with the egg yolk and cream mixture. Stir in half the meringues, broken. Gently spoon a third of the cream mixture into the prepared tin and freeze for 20-30 minutes or until set. Keep the rest of the cream mixture in the fridge. Once it has set, take it out of the freezer and pour in half of the cooked rhubarb. Reserve a little of the cooked rhubarb for decorating later, if you like. Top with another third of the cream mixture and return to the freezer for another 30 minutes. Once this layer has set, add the remaining rhubarb, followed by a final layer of cream. Cover with cling film and put it back in the freezer for 2 hrs to firm up. To serve, turn it out onto a serving plate and peel away the parchment. 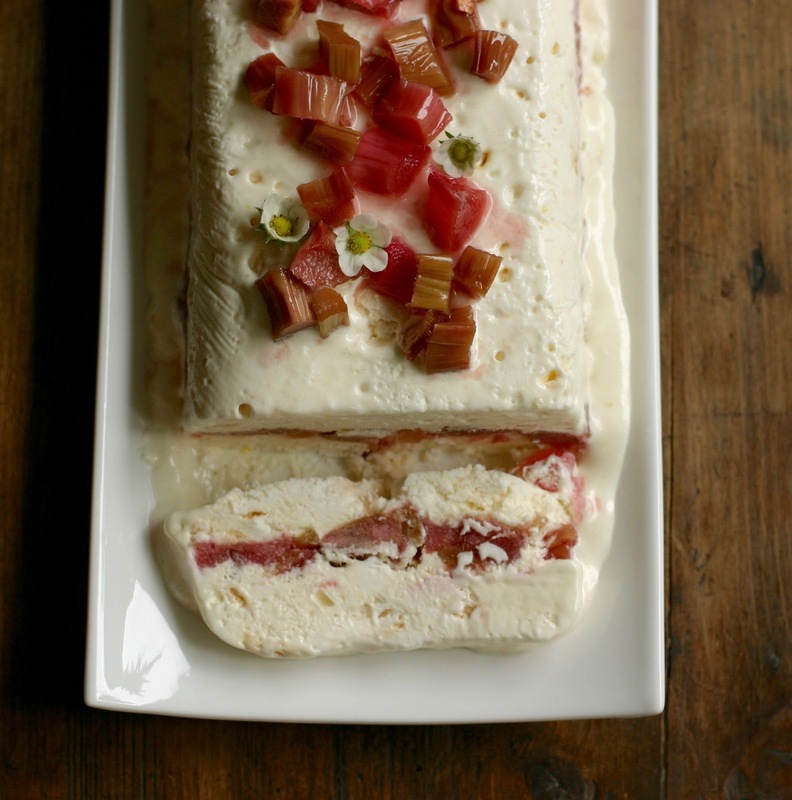 Decorate with any reserved rhubarb, the remaining meringue pieces and the candied ginger. Slice and serve immediately. I remember that as a child violets were one of my favourite flowers. We most often found them growing in virgin prairie grass in wooded areas. They are such a delicate sweet flower. Years later I found candied violets at Harrod's in London and purchased a little packet of them. I don't know how you can even compare these hard candies to the delicate woodland flower. I tried to love the candies but I couldn't. About seven years ago I moved back to Saskatchewan and purchased a little 1960's bungalow in a mature neighbourhood of a small prairie city. To my delight violets were growing in my backyard. That is the first time I candied my own. They have a delicate flowery fragrance that carries well through drying. 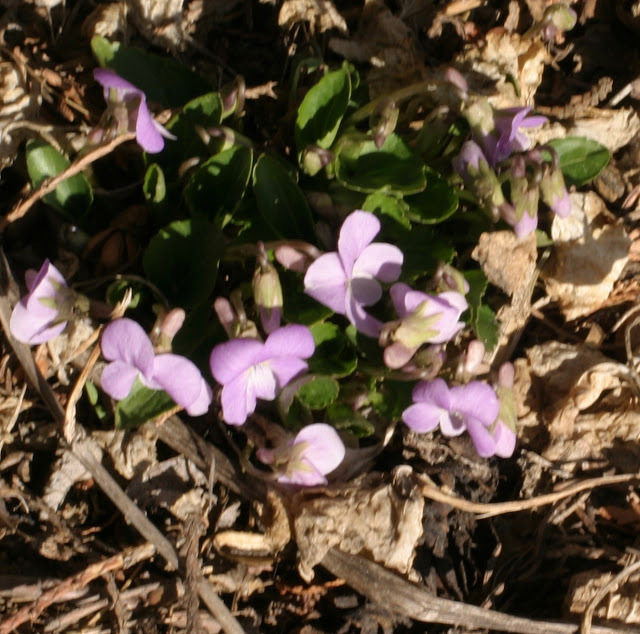 Pick the violets with their long stem. Be sure to pick from an area that has not been sprayed with chemicals. Mix about a tablespoon of dried egg powder with a tablespoon or more of cold water until the powder is completely dissolved. 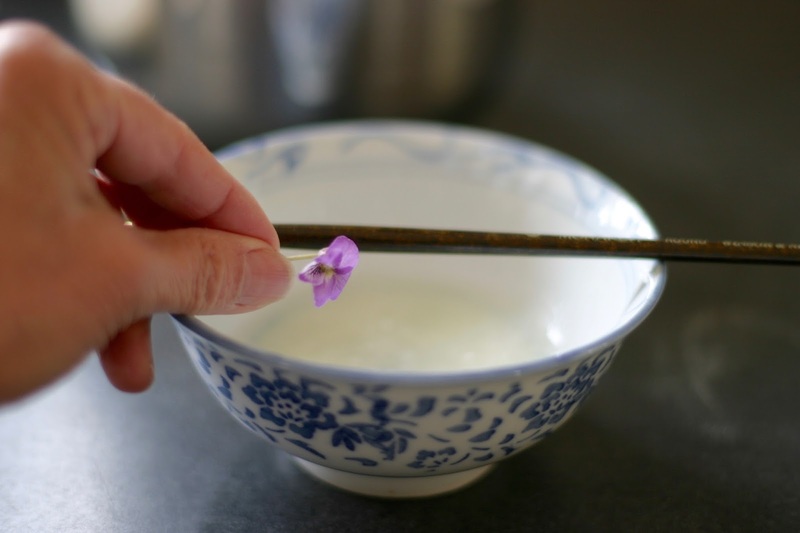 Dip the flowers into the egg mixture by holding onto the stem. Gently remove any excess egg white with the artist's brush. Clip the flower from the stem with scissors and drop it into dish of sugar. 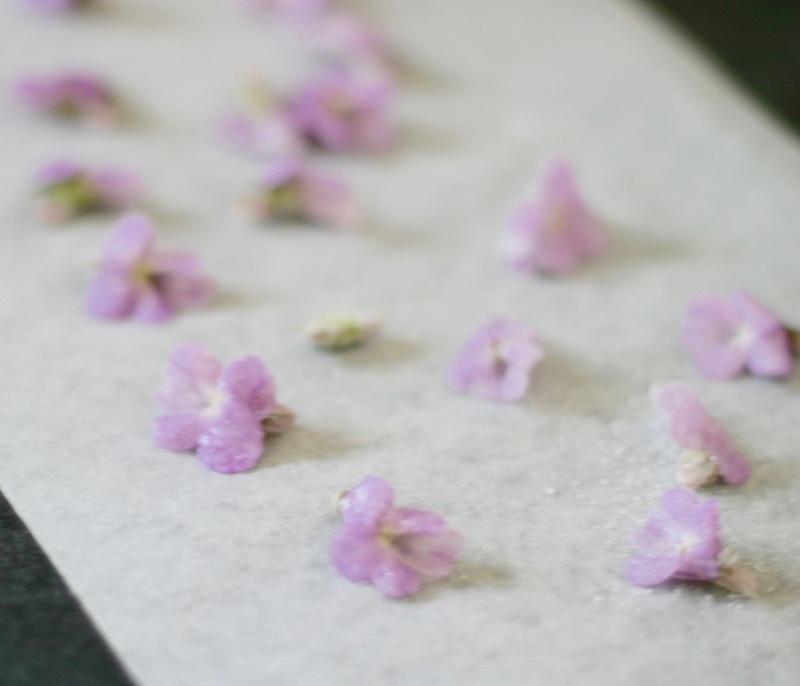 Coat flower with sugar and place on parchment paper to dry. Dry completely, about 24 hours. Store in an airtight container for up to a month. 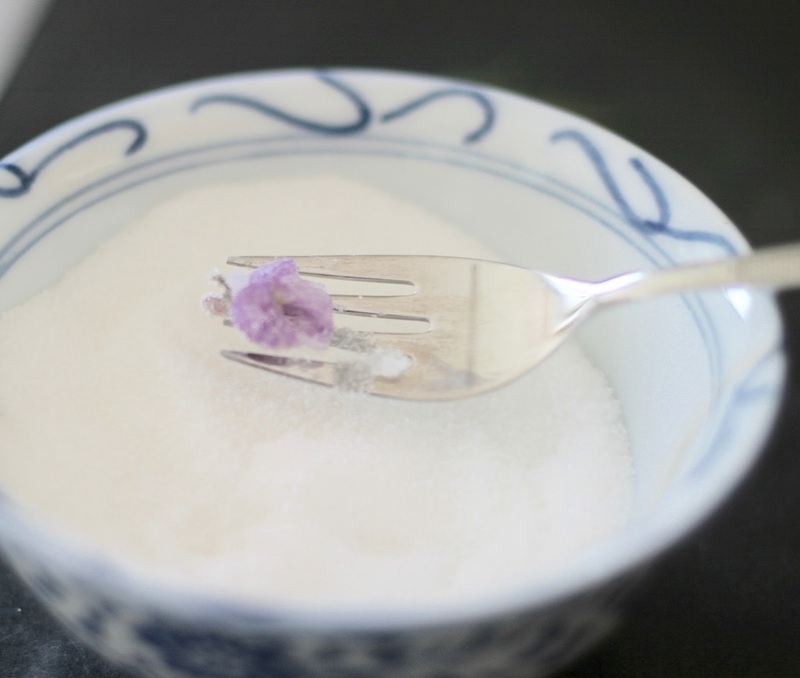 Use as a garnish on cupcakes, cakes and ice creams and other desserts. They are edible. COPYRIGHT © 2009-2013 SARAH GALVIN. ALL RIGHTS RESERVED. Copyright 2014 Sarah Galvin. Simple theme. Powered by Blogger.